My latest op-ed appeared in The Virginian-Pilot Wednesday. The impetus for the piece was the release Monday of a CNU/RTD poll (pdf), which showed the majority of Virginians not engaged in the November 8 elections. Low voter turnout seems to be the accepted norm these days, but when I took a look at the turnout statistics provided by the State Board of Elections after previous redistrictings, I was surprised at how far it has fallen. I think most political junkies and even casual political observers know that there’s something horribly wrong with our political system. And I know a lot folks take the “why bother?” attitude when it comes to voting. But this democracy of ours isn’t going to last if the people don’t voice their opinions.One way to do that is by voting, even if it means going to the polls and writing in someone’s name. And I absolutely abhor the constant harping on what’s going on in Washington. To me, it’s rather simple: if you want better government at the top, we need better government at the bottom. Besides the fact that a lot of those in Washington started out in state and local politics, a lot of the power is vested in the state government. Redistricting is obviously one of those items; after all, it is the Virginia legislature that draws not only their own lines but also those of our Congressional delegation. Some of it is less headline-grabbing, like this article about pre-K funding. Our governor made the decision to forego applying for as much as $60 million in federal funds that pay for it, relying on the old argument of unfunded mandates. The hypocrisy isn’t lost on me: the legislature puts unfunded mandates on the localities every day, especially in the area of education, where they haven’t funded the state’s share in years. So despite the fact that people aren’t paying attention to the General Assembly elections, they are important. Again, I have no answer as to how to make people care – it is, after all, a lot more important that the new iPhone was released or that Lindsay Lohan is going to jail, right? Previous Post How much money does your doctor take from industry? Next Post The end of Republicans as we have known them? 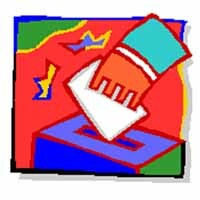 I thought we had it bad in Virginia Beach; on my ballot, there will be one contested race (special election to city council). If I lived in the 21st House district or the the lone VB precinct in the 6th Senate district I’d have a second race with a choice between two candidates. But I just looked up Chesapeake’s candidate list, and there is literally only one precinct in the entire city that will have a contested race (Waterway precinct, where the 21st House district pokes into from Virginia Beach). What is wrong with this state? What’s wrong is letting legislators draw their own lines. They will never give up the power until it is forced on them by the people. But the people have to care, and far too many just don’t. By the way – I have one contested race on my ballot as well.